I'm off to Scotland in a few hours for my cousin's wedding. I just have a few moments to blog my first SP9 package (!) and show off the projects I'm taking for the train. First up. The dress I'm wearing to the wedding needs a sash. 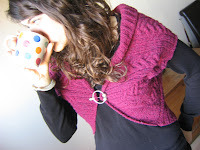 A great excuse to try a yarn I wouldn't normally have a chance to play with (Debbie Bliss 100% silk). 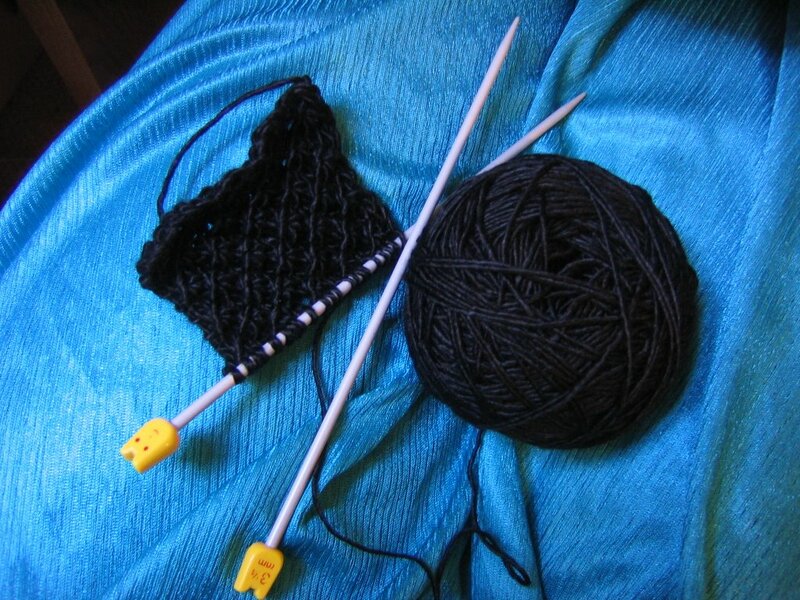 I'm normally of the view that bloggers shouldn't knit with black yarn, and when they do they shouldn't photograph it. But I can't resist. The green underneath was the dress I was wearing yesterday, not the one I'm wearing to the wedding, which is also silk and a sort of grey/ purple. I love that I'm knitting this super-glam yarn with my smiley-face needles. You'll just have to imagine how lovely it is to work with. The silk is such as small ball this won't take long. The main project I'm taking is my brother's birthday present. When he was little he lived in his Superman cape (well any fancy dress... pirates, Peter Pan, knights, but mainly Superman) and one christmas asked Santa for "super-boots". We couldn't find any, so I made some out of a pair of red wellingtons, with the superman symbol in gold paint on the side. For his 21st (last week) one of his presents from me was a voucher saying I'd do him a knit slipper-sock version if he told me his feet measurements. 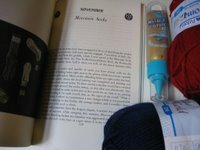 I'm using EZ's moccasin sock pattern with Paton's woolrich DK (for his sensitive skin). It'll be mainly red, with dark blue soles. I thought about a gold for intasia symbol, but I'm just going to paint it on. And, leaving the best till last, my first SP9 package! The parcel arrived yesterday afternoon long after I thought the post had already come and gone (along with my train ticket - so I was VERY pleased with the postman!). The parcel was just small enough to go through the letterbox and landed with a great thund on the carpet. I investigated the front for clues - somewhere in the USA. Then opened it - chocolate (now packed for the train), a flower notebook, a writing set (and I've been meaning to write some proper old fashioned letters recently!). Plus an aran sock pattern from knitpicks and oh, can my fingers feel some yarny goodness? By golly they can - some beautifully autumnal-coloured knitpicks sock yarn. It's so fun to receive packages! Especially yarny ones. I am eager to see the Super Socks. What a sweet thought. oooh, i've heard that essential yarn from KP is great! I hope you have a good time at the wedding! 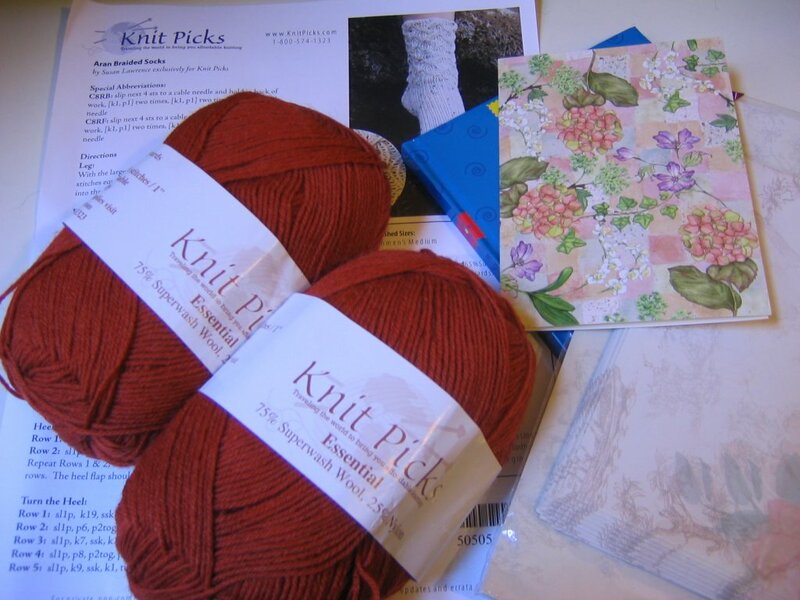 I really am addicted....my heart raced just looking at the new Knit Pick yarn YOU received! There's no hope. Have fun with the silk! I've been eyeing that up for ages. That is so cool! you are really talented. Have you thought of putting some of your more wedding related work on http://www.gatheringguide.com/ec/bridal_shops_dresses.html? Knit weddingwear needs to go more mainstream!